Dwarf Cichlids are pretty, friendly fish that can be enjoyed in a smaller aquarium! The Dwarf Cichlids display wonderful behaviors and personalities, and can be quite colorful too. Because they are small and generally quite peaceful, they are enjoyed by hobbyists with smaller tanks who want a bit of variety. These attractive fish require much less space than their larger cousins and are much more amiable with other tank mates. They are also much less prone to the habits of larger cichlids of destroying plants or digging in the substrate. This makes them ideally suited for a well-planted, attractively designed community aquarium. Apistogramma and other South American Dwarf Cichlids are favorites for the aquarist with limited space Just like their counterparts, the large South American Cichlids, they are fascinating to watch and interact with. Many species will also readily breed in the aquarium, adding to the excitement of keeping Dwarf Cichlids. South American Dwarf Cichlids come in a rainbow of colors, making a beautiful display. These little beauties have very attractive color patterns. They are found in both Central and South America., but this is a large geographical area that offers a wide natural distribution for these cichlids. Consequently many species can be obtained in a variety of color morphs as well. West African Dwarf Cichlids are interesting and beautiful little fish as well. They come from many African rivers and streams, and can be very striking. Some very popular, long time favorites are the Kribs or Kribensis Pelvicachromis pulcher. Besides being small, being beautiful is one of their most attractive features. They are easy to keep and feed, and fairly easy to breed. There are many other small cichlids from the great African rift lakes as well, giving the aquarist with a small tank tons of fish to choose from. Dwarf Cichlids are small cichlids that only reach up to about 4 inches (10 cm) or so. Considering their vast natural distribution around the globe, cichlids are found in a wide variety of conditions. It is simply not known how many species there are that could be considered Dwarf cichlids. There are over 240 identified species or forms of Apistogrammas alone. South American Dwarf Cichlids, also known as the New World Dwarf Cichlids, are found in both South America and Central America. Central and South America comprises a huge geographic area with greatly diverse habitats ranging from savannas to rain forests. The South American waters are described as three types: clear water, white water, and black water. However, while there can be a significant variation in pH levels, all of the waters of South America are soft to very soft. These Dwarf Cichlids may be acclimated and survive in harder water, but it will be very difficult for them to successful spawn unless the water is soft. West African Dwarf Cichlids are found in rivers and streams, other African dwarf cichlids or found in lakes, including the great rift lakes of Malawi and Tanganyika as well as great Lake Victoria. 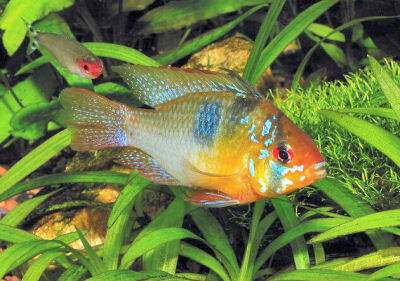 West Africa Dwarf Cichlids are found in inhabiting waters of rivers and streams and along coastal zones. These waters can vary greatly from soft to hard and from fresh to brackish. Others are found in the great rift lakes where the waters are known for clarity and stability. Lake Malawi has alkaline water that is highly mineralized, and Lake Tanganyika water is very stable and oxygen rich. The Dwarf Cichlids do not constitute a group that is rigidly defined either taxonomically or by distribution. Rather it is a term that is used to describe small cichlids, reaching only about 4” (10 cm) in size. Originally the term, dwarf cichlid, was used to describe just one species, the colorful Apistogramma agassizii from South America. Then the term was extended to include all the Apistogramma species. But today it is used to denote all cichlids that only reach a modest size, regardless of their scientific designation or origin. Many of the small African cichlids are not usually included in discussions about dwarf cichlids, as they are specialized for other reasons like unique body shapes or being more difficult to keep. For more in-depth information about the different types of cichlids from Africa, please see the article on African Cichlids, as well as the particular groups of cichlids in each lake, African Cichlids from Lake Malawi, and African Cichlids from Lake Tanganyika. The Apistogramma species are perhaps the most popular and readily available Dwarf Cichlids. Other highly favored species are the Mikrogeophagus (Microgeophagus) that include the well-known Ram Cichlids and the Bolivian Ram. Yet these are not the only beautiful specimens of South American Dwarf Cichlids. A number of other genera include Apistogrammoides, Herotilapia, Taeniacara, Biotoecus, Crenicara, Dicrossus, Laetacara, and Nannacara. West African Dwarf Cichlids make fascinating aquarium inhabitants, as exemplified by the pretty and popular Kribensis or Krib Pelvicachromis pulcher. This beautiful cichlid is often the first choice for those new to keeping dwarf cichlids, and has been kept by hobbyists for many years. Dwarf Cichlids are found from West Africa, Lake Malawi, and Lake Tanganyika. Many small cichlids from the great African lakes include species from these genera: Pelvicachromis, Nanochromis, Steatocranus, Benitochromis, Pelmatochromis, Thysochromis, Chromidotilapia, and Tilapia. Most Dwarf Cichlids will be content in an aquarium as small as 20 gallons. They are generally peaceful fish, but as with all cichlids, they do establish a territory and will defend it from intruders when egg laying is imminent. Many are also shy and rather delicate. They will do best when kept by an aquarist with a bit of fish keeping experience rather than an absolute beginner. The size of the aquarium you will want can vary depending on the number of fish you want to keep. Though content in an aquarium as small as 20 gallons, a larger aquarium is always preferable for the aquarist’s ultimate enjoyment and to keep a larger community. A good rule of thumb is approximately ½ “ (12 mm) of fish per gallon (4 L). When setting up a tank for Dwarf Cichlids, keep in mind that you will want to provide them with water that is fairly soft. With Dwarf Cichlids, egg laying is generally imminent as well, so it’s important to provide them with a number of caves. For the open-spawners, a number of small smooth rocks will be appreciated. Having a well-planted tank not only makes a very attractive aquarium but will also be appreciated by most fish. Dwarf Cichlids can be fed frozen brine shrimp, crustaceans, insects, insect larvae, and some may eat flakes and pelleted foods. Feed 2 to 5 small pinches of food a day in smaller amounts rather than a large quantity once a day.